Time for another mid-century road-trip! 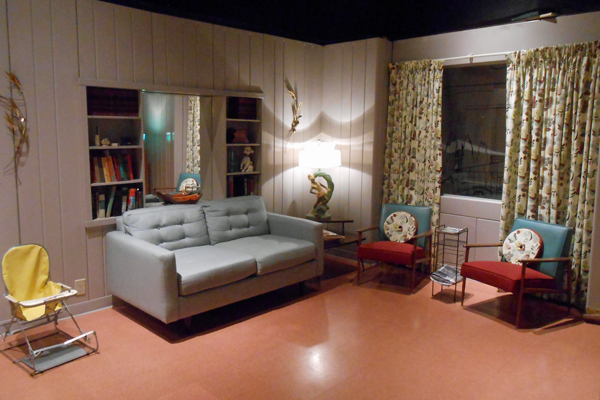 This time we headed to Columbus, Ohio, to tour the Lustron house that resides inside of the Ohio History Museum. 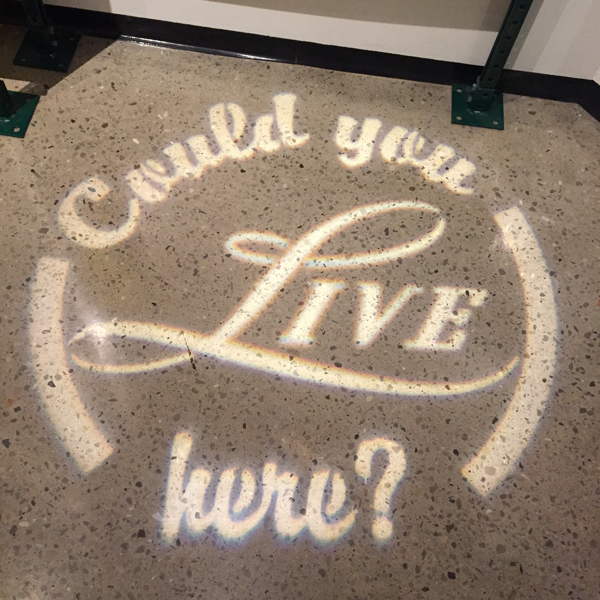 Could YOU live here? I could. Not familiar with Lustron homes? They were the dreamchild of Carl Strandlund, an entrepreneurial immigrant from Sweden. During the war, Carl worked with the Chicago Vitreous Enamel Company to convert their factory from manufacturing the vitreous enamel, 2 x 2 steel panels used most often on filling stations, to a war production plant. It was here that Carl became enamored by enamel. (Yes, I just said that.) 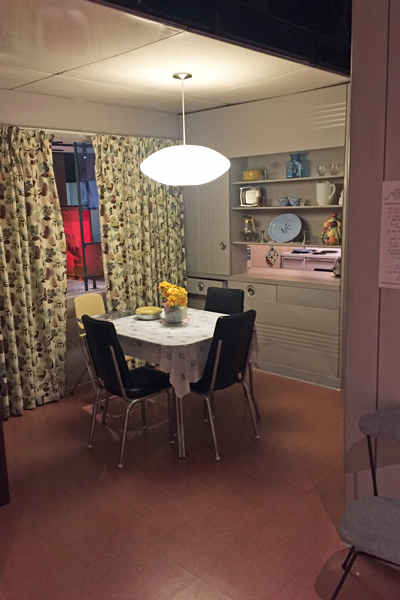 Post-war, with service members arriving back to the United States in droves, housing became incredibly scarce, and the government was looking for ways to create quick, affordable, mass housing for these countless young families. Carl Strandlund and those vitreous enamel panels to the rescue! 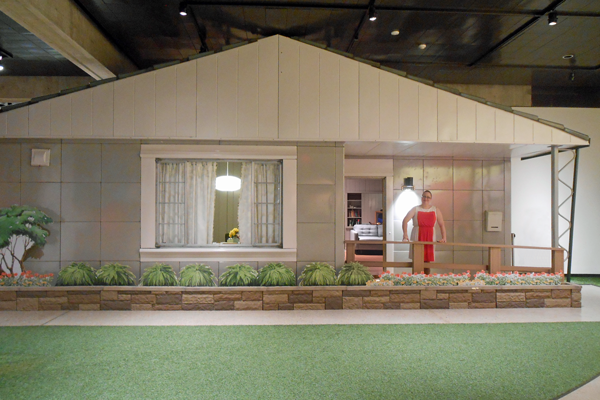 Carl teamed with designer Howard Ketchum to create three-floor plans for homes which could be mass-produced in a factory and sent on a flat-bed truck or rail car to the home site and assembled in four days – much like an erector set. Families could choose from four colors and everything, inside, outside and the roof was made of vitreous enamel over steel. It was the house that never needed maintenance! Lustrons have always held a special place in my heart. There are quite a few Lustron’s in the area where I grew up, even though so few were ever built. It was in graduate school, studying for my Master’s in Historic Preservation, that my curiosity about the Lustron dream ignited and I wrote a research paper on the subject. I even toured around my neighborhood taking photographs (with a film camera; I’m old), and one of the owners invited me in. Lucky me! This past weekend was only the second time in my life when I was able to step inside of one of these beauties. Although Carl and Chicago Vitreous was originally from Chicago when it came down to procuring a plant for the manufacture of the homes, the former Curtiss-Wright aircraft plant in Columbus, Ohio was chosen. (Anecdotally, the plant Strandlund wanted in Chicago went to Preston Tucker and the Tucker Motor Company. It didn’t go much better for him.) 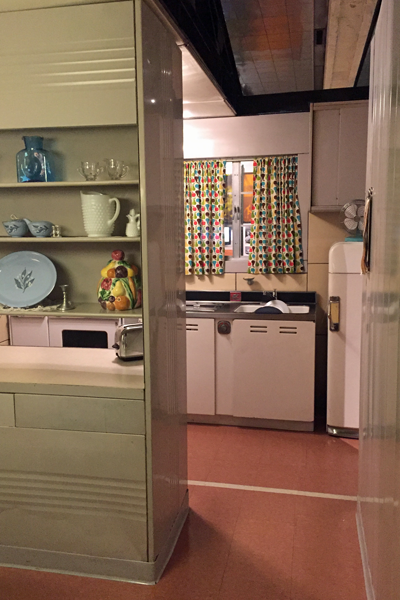 The history Lustron has with Columbus still runs deep which is why the Ohio History Museum now has one of these re-erected homes indoors in their museum. View from the dining room into the kitchen. The home is with period-appropriate furnishings, flooring and also many knick-knacks and everyday items. 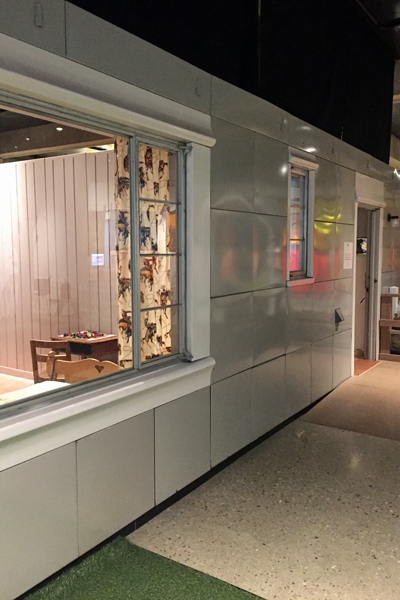 They encourage children to play with items and get a feel for what living in this type of home might have felt like. The home is small, and it is all metal, but it’s comfortable and still fashionable after all these years. Certain features of the Lustron are quite clever and space-saving. The living room has a built-in bookcase which backs to a built-in vanity in the master bedroom. All of the doors (closet and room doors) in the home are pocket doors to save swing space. (This is also a detriment as those that still own Lustrons will attest; the hardware tends to fail and finding replacement hardware can be challenging.) For you mechanical engineering nerds, the area above the ceiling was left open as a plenum return, heating the house uniformly by warming the ceiling panels which would in-turn radiate into the rooms. The divider between the kitchen and dining rooms has a pass-through as well as built-in dish and linen storage. 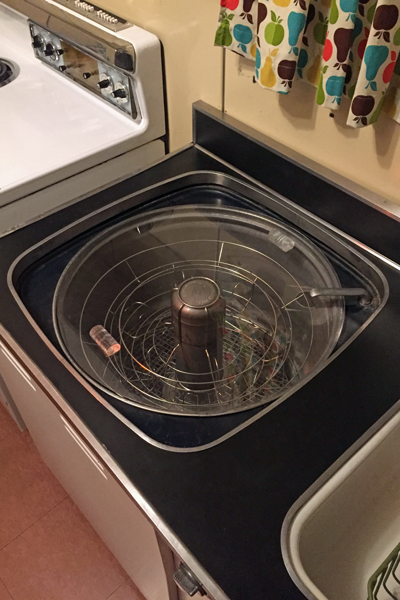 However, probably the most fascinating space-saver item in Lustrons has to be the Thor Automagic, a combination dishwasher and clothes washer (though not at the same time.) 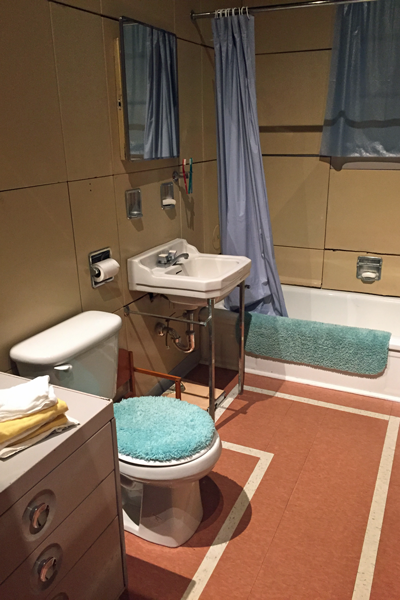 Even the bathroom has a built-in chest of drawers for towels and toiletries. The bathroom. Notice how the wall panels curve at the bottom over the tub for a drip edge. Check out the ogee on those headers! The vitreous enamel panels were also pressed into several shapes to minimize the maintenance on the home. The roof shingles are individually pressed, vitreous enamel pieces. 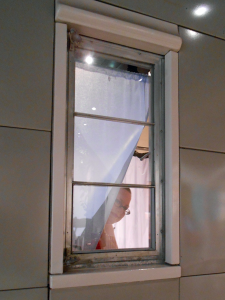 The headers over doors and windows have an ogee to help divert rain away from the aluminum sashes. Magnets are used on the interior of the house to hang things – the benefit of having metal walls; you can rearrange your décor on a whim! We saw a number of other fun things during our weekend in Columbus, but that’s for a future post. If you happen to be in the Columbus area, stop in to see the exhibit. The exhibit is ongoing - but be sure to check it out because it will not be there forever.